Jessica Goldman Foung is a food writer, blogger, and spokesperson for the National Kidney Foundation. She lives in San Francisco. Hundreds of millions of people live with medical conditions that require they lower their sodium intake—heart disease, hypertension, kidney disease, and diabetes, to name a few—and research shows most of us would be healthier if we consumed less salt. What could be a challenge becomes an opportunity in Low-So Good, a beautifully photographed book about living a rich life with a low-sodium diet. With 70 recipes for much-loved food (including fries, cake, and dips) and chapters filled with information about how to entertain, dine out, travel, and create a supportive community, Low-So Good empowers anyone to become an expert at living well with less salt. “Low-So Good handily dispels the myth that a low-sodium diet is boring and bland. This ultimate guidebook to low-sodium living shows folks how to create healthy, satisfying, and umami-packed meals and set themselves up for success. Bravo!” —Michelle Tam, New York Times-bestelling author of Nom Nom Paleo. “Think eating less salt means a life with less flavor? Think again! Low-So Good opens your eyes to the big, bold work of taste that lies beyond the salt shaker. It is a fun, fearless, fresh guide with all the tools you need to make your low-sodium life deliciously do-able. Get this book and get inspired!” —Ellie Krieger MS RD, TV personality, and award-winning cookbook author. Millions of people live with hypertension or chronic kidney disease, and for them, eating a diet low in sodium is a vital part of maintaining good health. And, on average, Americans consumer more than double the lower recommended daily intake. Unfortunately, there just aren't enough great low-sodium cookbooks that offer the kind of dishes that home cooks want. But not any more! In Sodium Girl's Limitless Low-Sodium Cookbook, Jessica Goldman Foung, the blogger behind SodiumGirl.com, presents an enticing collection of recipes that bring color and excitement toa low-sodium diet. With creative substitutions, Foung shows people how to lose the sale and keep the foods they love. With this vibrant cookbook, eating great and staying healthy are one in the same, proving low-sodium can be a delight and not just a doctor's orders. 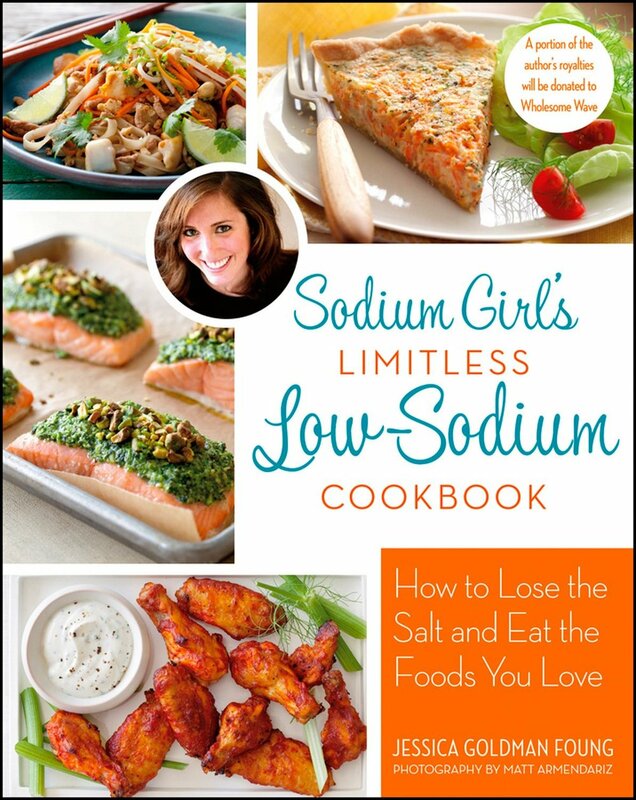 Whether you've just been diagnosed with a condition that demands a low-sodium diet, or you just want to maintain a healthy lifestyle, Sodium Girl's Limitless Low-Sodium Cookbook is the perfect resource for your low-sodium kitchen!